… you not only name your sports teams after the people your ancestors conquered but taunt the opposing high school football team with witty banners referencing events those vanquished peoples’ descendents consider to be terrible catastrophes inflicted upon their groups by your own predecessors. 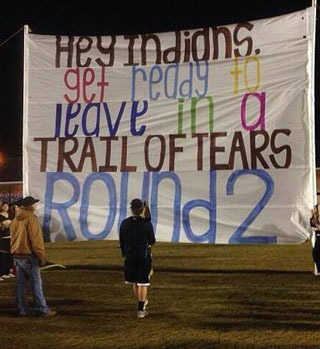 “Please accept our sincere apologies to the Native American people and to anyone who was offended by the reference to an event that is a stain on our Nation’s past forever,” [McAdory High School Principal Tod] Humphries said in a statement. Learn more about the Alabama high school sign and the apology here; learn more about the “trail of tears” here.